First we need a really long ramp. This ramp at the Mansfield dam Park is about four lanes wide. The top of the ramp is at 685 feet above sea level. The bottom of the ramp is at 635 feet above sea level. In this photo the Lake is at about 660 feet above sea level. We have just finished raising the mast and driving the boat from the rigging area to the ramp. 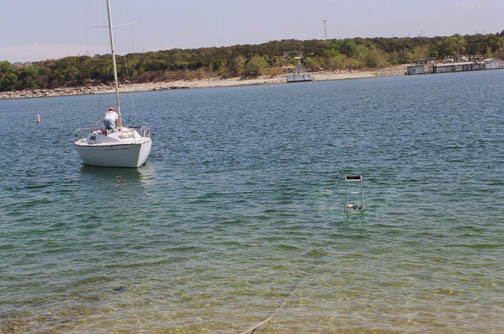 The trailer ladder is too far from the boat for Richard to safely climb down. The extension ladder is unsafe on a tilted surface. Richard is riding on the boat. Alfonzo and Fred are on the ground. This rope is VERY important. fresh bottom paint, especially the Teflon impregnated coatings, can be very slippery. We do not want the boat to slide off until it is floating. This 7/16 inch rope is nearly new and wrapped twice before being tied with lots of overkill and unnecessary extra half hitches. 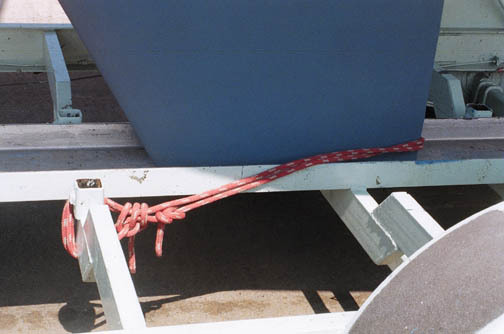 It is carefully tied so it will not do anything unless the boat slips. 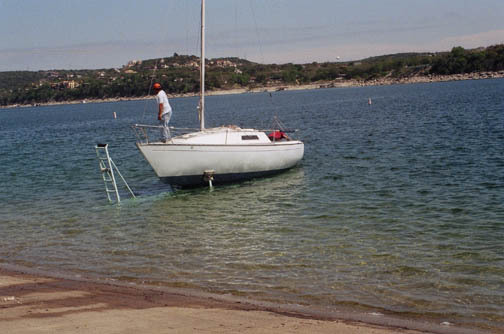 It is absolutely tied so the keel cannot slide over it. Paranoia can be a great thing when the goal is NEVER having a disaster. 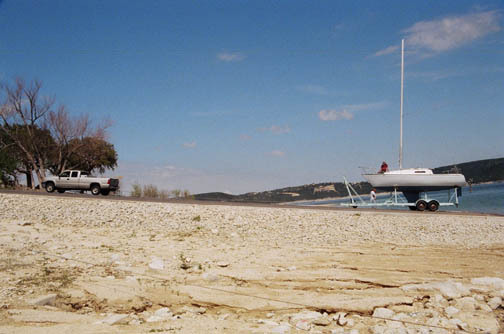 We will sink the trailer until the boat floats over the rope. We have chocked the trailer wheels. It is important to chock all four wheels as the trailer is designed to "walk over" lumpy roads. We don't want the trailer to jump the chocks. We have disconnected the trailer and pulled the truck up the ramp. Alfonzo is cranking the tongue down. The truck hitch is rather high. The tongue jack was almost fully extended when the trailer finally lifted over the ball. He had a lot of cranking to do and by the time I took this photo he was almost done. The tongue is now sitting on our big launching wheel. 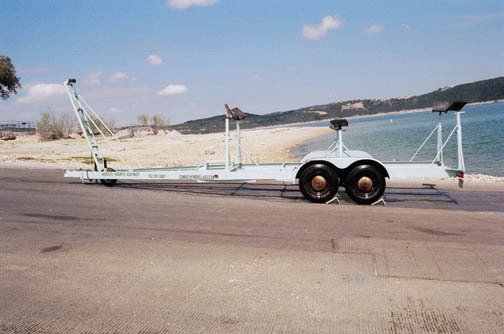 It is designed to help the trailer to roll in a straight line. We have removed the 2 x 6. 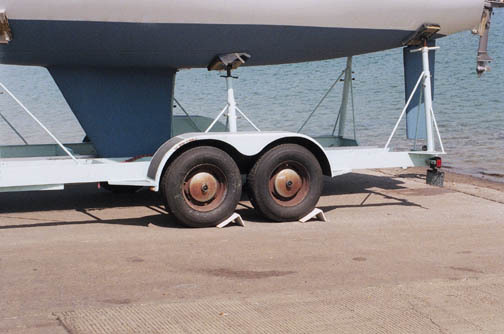 It is important that the trailer tongue be very low because the ramp is slanted. 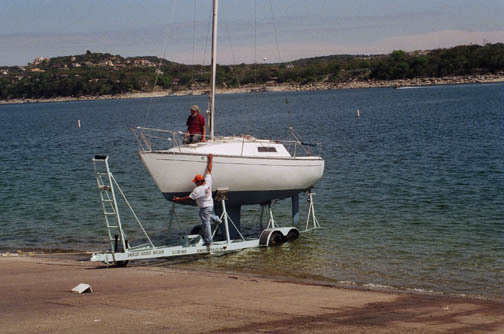 When the back of the boat begins to float, the keel is lifted from the keel support and the entire front end of the boat will be supported above level by the front pads. 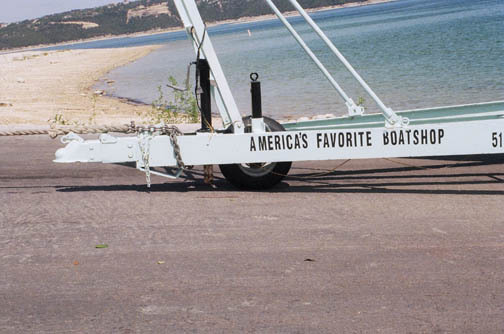 On a small boat like this San Juan 7.7 and with the trailer tongue well down this is not an issue. 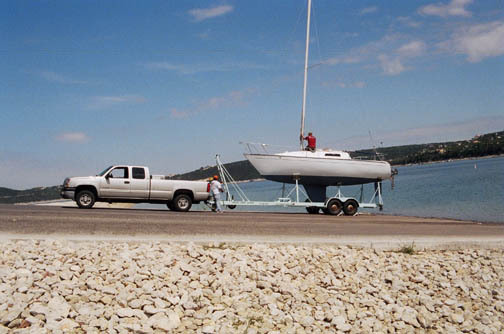 On 40 foot boats, the trailer must be adjusted and the front pads must be lowered as the boat is lifted by the lake or the front pads will stress or even do severe damage to the front of the hull. 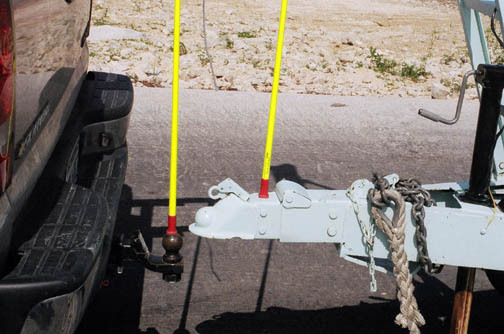 The rope is attached to the truck with this simple chain and splice system. 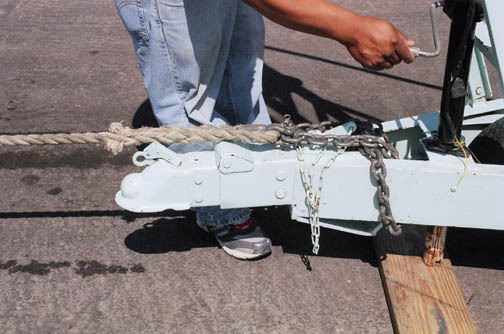 When we back up, the chain sags below the hitch and the connection does not end until we physically lift the chain free.. We do not use the rope itself to fasten to the ball because the rope is quite stiff. Sometimes a 1 inch nylon rope is stiff enough that it can have a mind of its own. A friend of ours had her J-22 launching rope lift off the ball and her trailer rolled about 100 feet back on the submerged ramp. We don't want to repeat that mistake. Alfonzo is going to ride to the marina with Richard. This boat stays at Marshall Ford Marina. which is in the background. Actually you can only see the opening to the cove. The southwest side of the cove is just above Richard's head. Marshall Ford / Quinlan Park is behind the forestay. Too bad this part was not a video. That step Alfonzo just took from the trailer to the gunwale is huge. Notice how deep the ladder is sunk. We not only try to clear the keel safety rope but we like to sink the pads below the keel. We back off as slowly as possible but the trailing edge of most sailboat keels is fragile. The carpeted plywood pads are relatively forgiving but contact with any of the steel trailer supports can do harm to the soft lead and paints. Soaking the trailer in six or more feet of water means lots of expensive maintenance. Every moving part needs regular cleaning, inspection, and lubrication. There are the obvious five wheels with bearings. Tires cost over $160 each. The hull supports have regularly lubricated 1 1/2 inch all thread screw jacks. The fresh wet trailer is chocked. The horizon is real. It looks like the bow of the 7.7 had to endure being lifted at least a foot by our front pads. That lift on our big soft carpeted pads did not harm the boat but we wouldn't want to use square pads to lift that bow much higher. The adjustable pipes have four carefully lubricated pinch bolts on each socket. The ladder is fully adjustable, but only if the nuts and bolts can be moved. The lights must work, the trailer must be regularly inspected, sanded and repainted where rust is found. The carpet lasts less than a year. 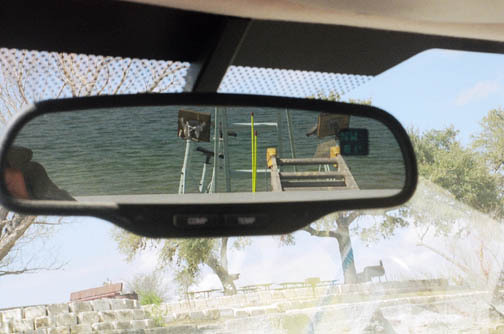 The rear view mirror has this view. All I need to do is back up slowly and knock the stick off the ball. It's magic. When the stick falls, I stop and check to see how I did. Usually I have to move an inch or so foreword or back. 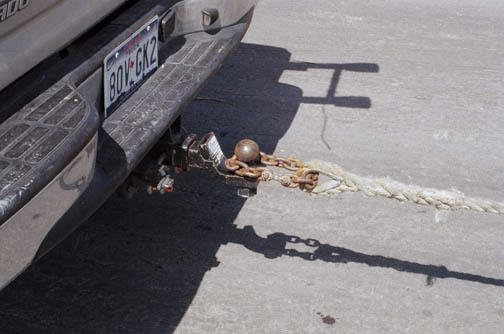 Notice the chain on the trailer end of the rope. Trailers have lots of sharp edges. A;lthough it would be hard to cut a 1 inch rope, slicing the rope in half would be tragic. Regardless, the chain is the only part that touches the metal trailer. That chain saves us a ton of money on rope. The trailer is all hooked up and ready for the highway. The jack is fully retracted. The wires for the lights are hooked up. Notice how the chains are shortened by twisting. Also notice how the chains are crossed to form a basket. The crossed chains will not bind on sharp turns. 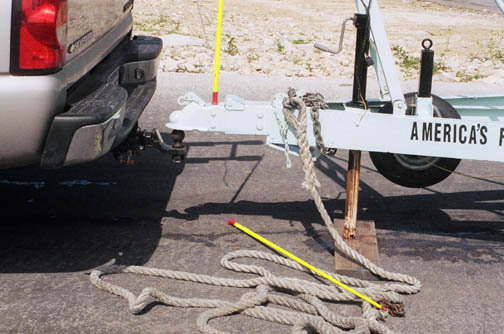 If you hook up chains without crossing them, they must be left loose enough for sharp turns. Safety demands the shortest possible chains. 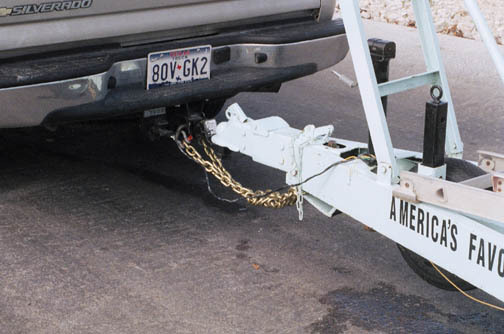 if the latch fails, you want the trailer to remain close to the vehicle and under your control.